OMG!!!! This Delicious Mixed Pink Dahlia Bokay Direct from Our Farm to your Table. We have 4 Varieties of Pink and will try and mix them up for ya. 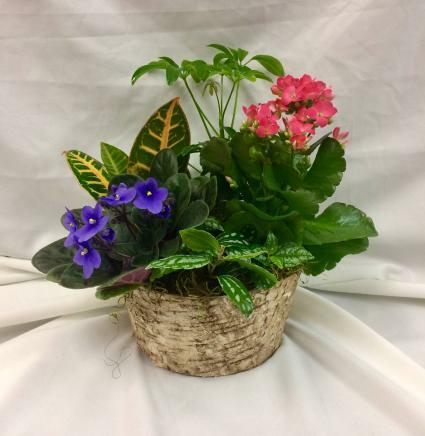 Designed in a Simple Glavanized Bucket. So Trendy Farm!!! Available August-September. 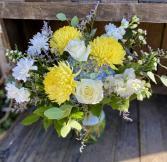 We can make something similar to this style and color with other fresh seasonal flowers throughout the rest of the year. 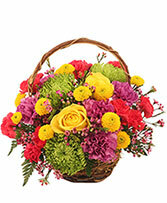 A sweet and cheery arrangement sure to brighten anyone's day!! 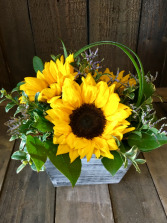 Three sunflowers in a white washed wooden box accented with mixed greens and filler. Container is 6" x 6" x 4".